Our train, SE3, was a bit late. A Vietnamese lady, who was on her way to Da Nang helped me out with identifying the station when our train arrived at Hue. Designated vendors were ferrying various food items for breakfast along the aisle. They were in uniforms and were probably employees or contract workers for Vietnam Railways. We decided to forego our breakfast and have something once we had alighted SE3 at Hue. A man selling breakfast items on SE3. The moment we got down from the station, quite a few taxi drivers approached us. We kept shooing them away and asked one of them where could we find some food. A lean man in specs approached us and took us to a shop. The shop had a funny name. Mr Pho – Pho Cafe. Now, Phở is Vietnamese noodle soup. Mr. Pho was the guy who escorted us to his shop. He explained that there is a significant pronunciation difference between the two Pho’s. His name sounds like Four but without the ‘r’. Phở with the diacritic is ‘Phuh’ where uh part is like the sound we make when we get hurt but it must be stopped abruptly. 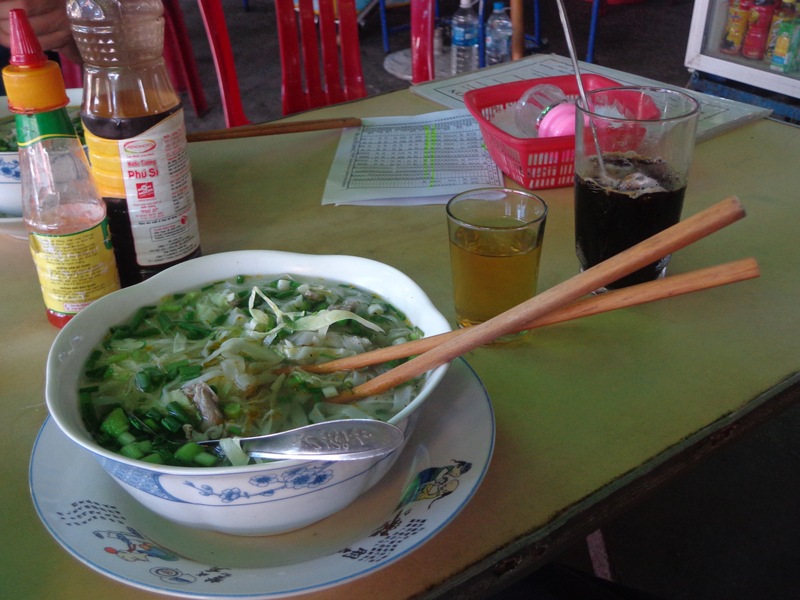 Naturally, we ordered some Phở from his shop. The food was very normal. 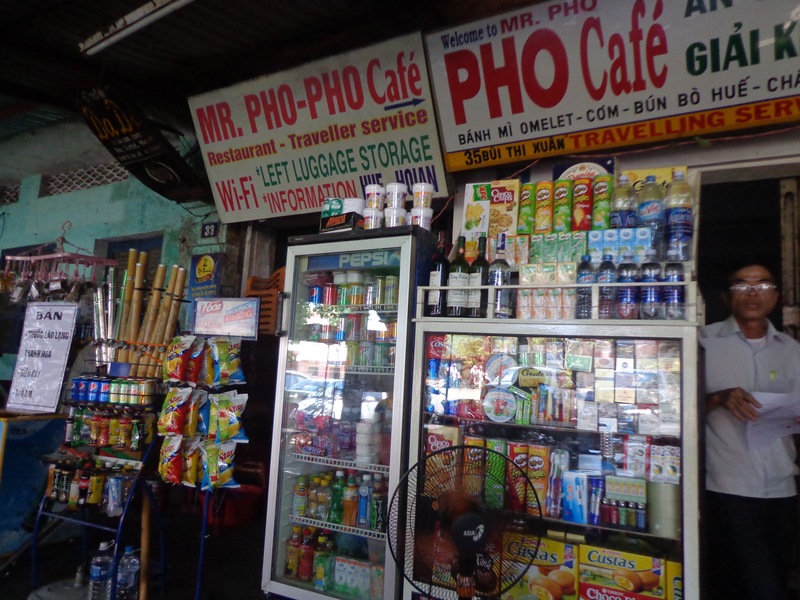 Mr. Pho – Pho cafe is located just opposite to train station. Phở, Tre (pronounced Cha – tea) and Ca Phe at Mr. Pho’s. If you look up on TripAdvisor (Mr. Pho insisted that we look him up and I did), you would find a lot of nice things being said about this man. When he was young, he used to be a tour guide. Now that he is old, he has set up a shop opposite to Hue station and offers free advise to weary travellers. He makes his living through his food and the inexpensive services he offers like arranging cheap buses, providing locker rooms, etc. He explained us how we can visit the city and advised us how we can save both time and money while going around. We altered our plans because we felt that he gave us a lot of good advise regarding booking and transportation. He even gave us maps and annotated them while explaining what to do and what to avoid. We spent almost two hours at his shop. In the end, we were armed with newer and better information. 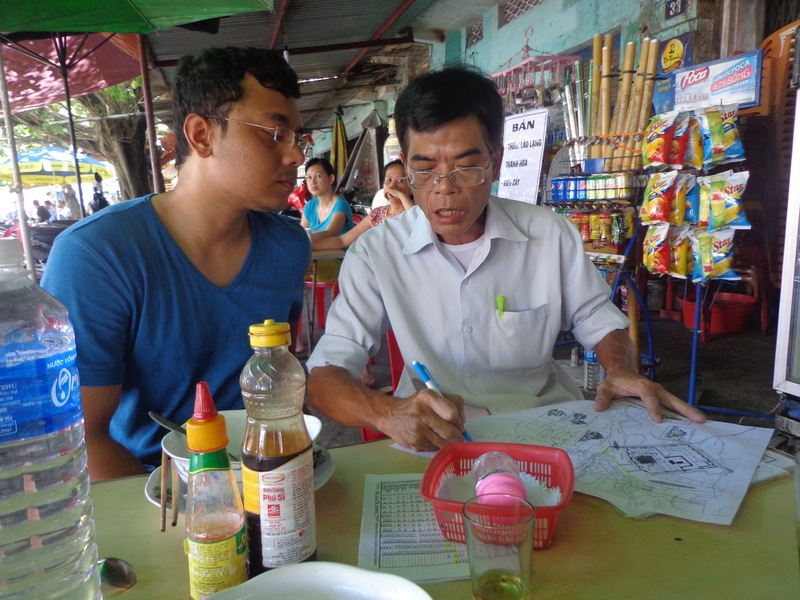 Mr. Pho explaining Nandy stuff on a map of Hue. Mr. Pho also asked us a lot about India. He said that ever since he read Jules Verne’s Around the World in 80 days, he wanted to visit India. He enquired about Taj Mahal and the serpent with many heads that cover a man! He was surprised to know the variety of languages in India and that we had to converse in languages that were not our mother tongue just to get around India. Mr. Pho was not the only helpful guy in Hue. Our host, Michael, at Four Seasons hotel was a helpful guy, too. He explained a lot of stuff about Hue. 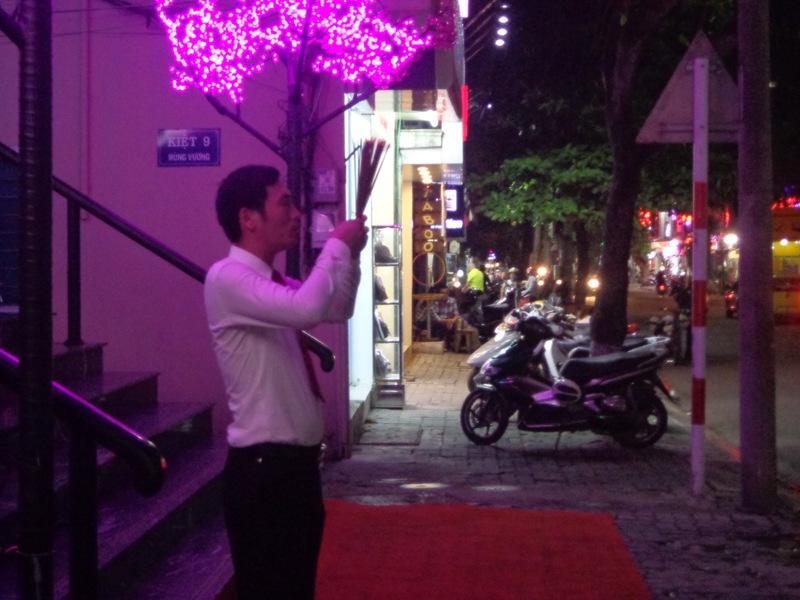 One very important information was that there is illegal prostitution in Hue. Rickshaw drivers would approach tourists and say, “Lady, Lady.” This means that he is a pimp. It is best to walk away from them. I can’t stress enough how important this information was to us when we went exploring the Hue marketplace in the the evening. After a long nap in the hotel (and it was necessary), the sun had set and the temperature outside had become much more pleasant. We went to a restaurant and had our fill. As usual, I had some Vietnamese coffee with my meal. The waiter and the owner was extra friendly because they don’t see much Indians around here. I got to know that before the war, a lot of Indians ran clothing shops in Hue. This is how a traditional Vietnamese coffee is brewed. The perforated aluminium container has roasted coffee powder. Hot water is poured inside and is allowed to trickle into the the glass to make the concoction. We walked around the streets of Hue. It is a mid sized city and harbours a lot of Vietnamese heritage. It is also a centre for art and literature. 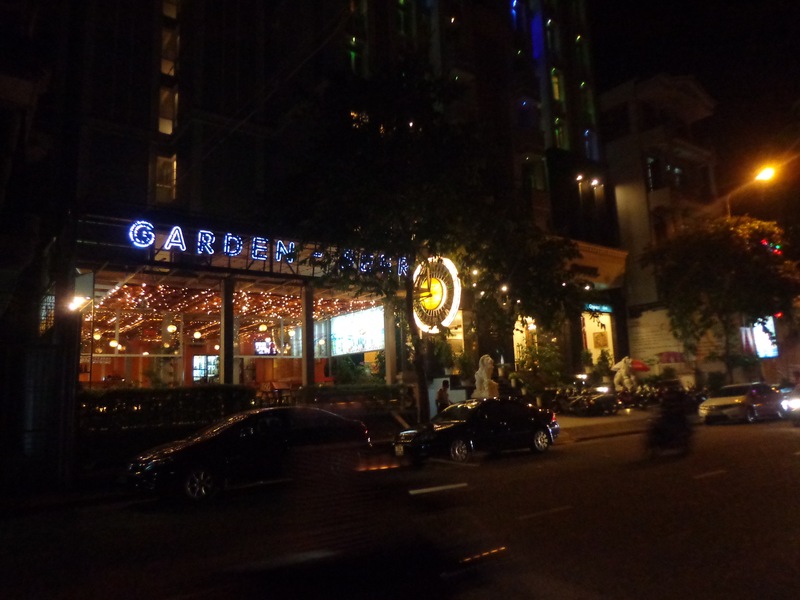 As a result, the city is much laid back than Ha Noi or Ho Chin Minh City. A commercial road of Hue at night. I bought a T-Shirt from this road. And no, it doesn’t say “I love Vietnam” or anything like that. A man offering prayers outside a pub. Maybe he is praying for good business and prosperity. 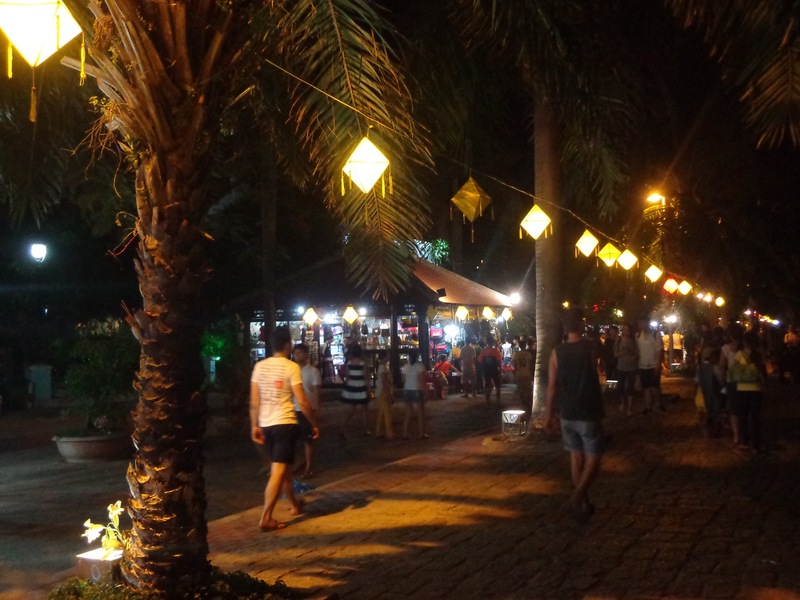 The shopping street beside Perfume river offers souvenirs for tourists. 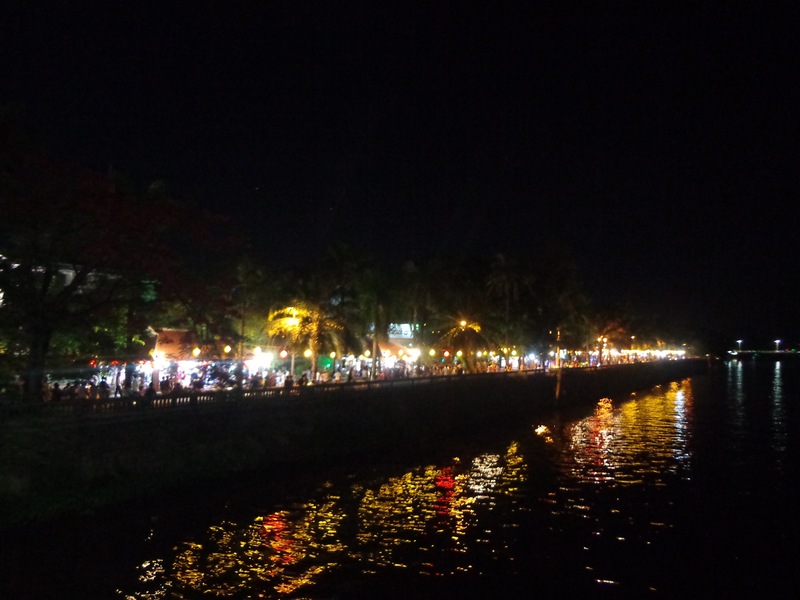 Perfume river at night illuminated by commercial establishments across the river. We bought some consumables from a co-operative shopping mart. Most of the stuff was much cheaper than what we had otherwise paid outside. There were a lot of eatables that were imported from China and Japan. 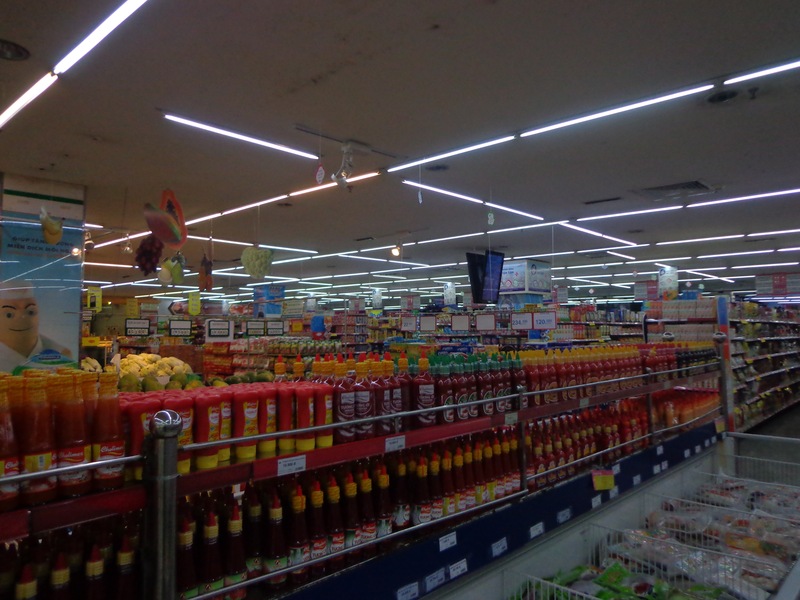 The co-operative supermarket in Hue isn’t much different from those in Bangalore. I came across a big bookstore. Almost all of the books were in Vietnamese. 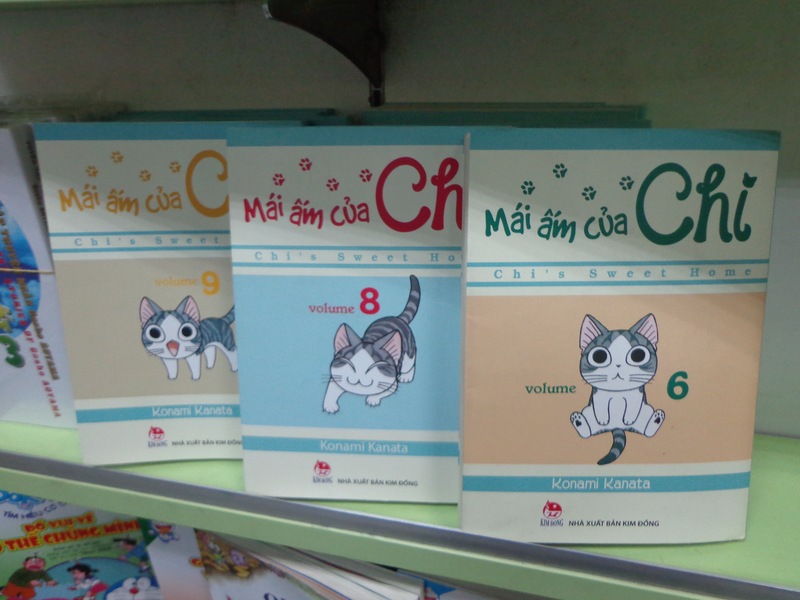 Even popular English titles are translated to Vietnamese. I came across J.K. Rowling’s Harry Potter, Steig Larsson’s millennium trilogy, Rick Riordan’s Olympians and many more. 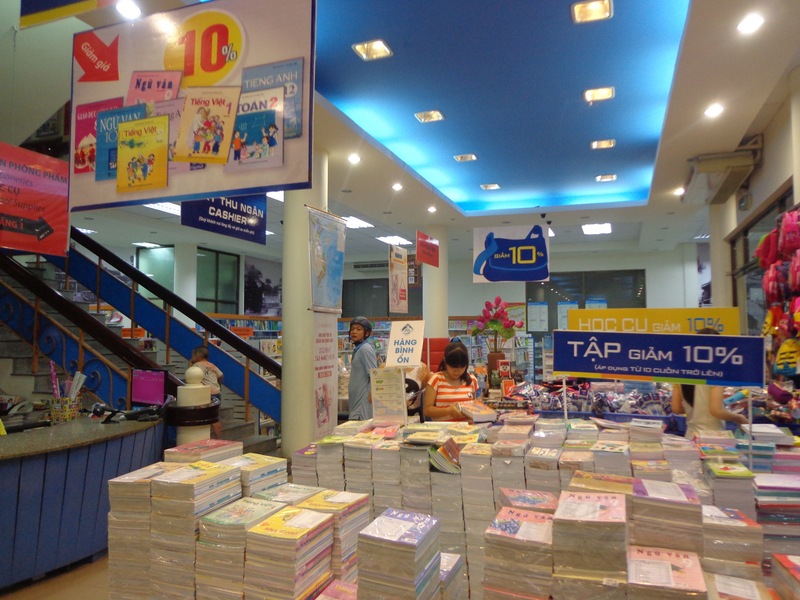 A big bookstore and stationary shop in Hue. 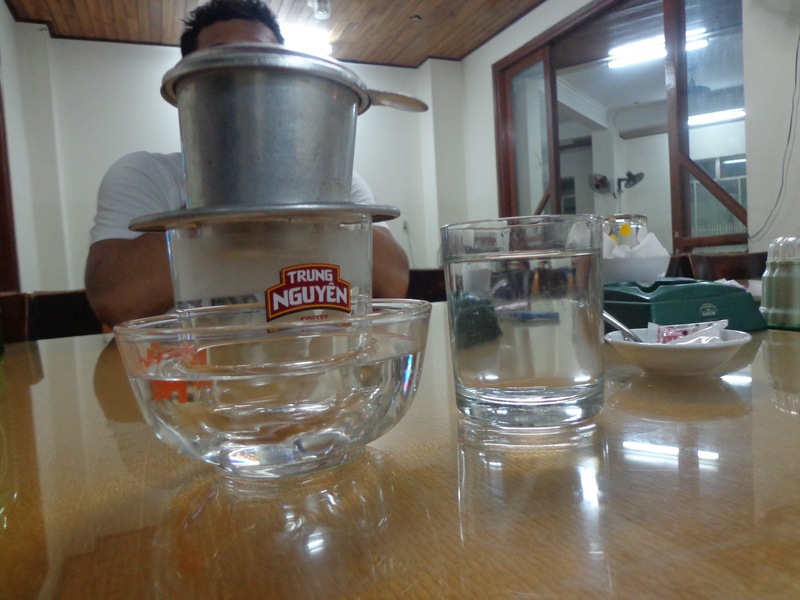 We also had some strong Vietnamese coffee here. I used my phone to show the worker a picture of Tintin and asked if they have a Vietnamese edition of Tintin albums. They only had The Broken Ear. I knew that getting Tintin in Vietnamese was hard but this was a genuine stroke of luck. Tintin – The Broken Ear in Vietnamese. 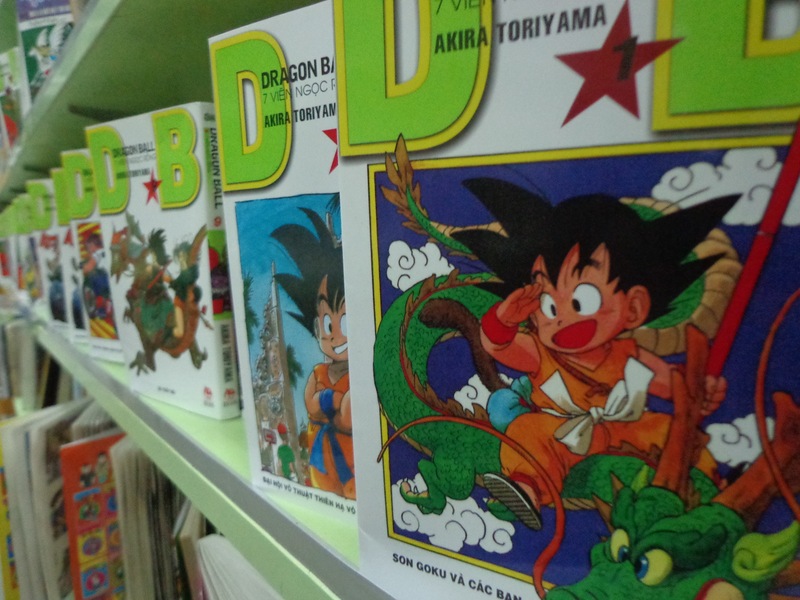 Dragon Ball – Unlike the English edition, they have not split the series into two. The 17th volume is the 17th volume and not Dragon Ball Z, volume 1. 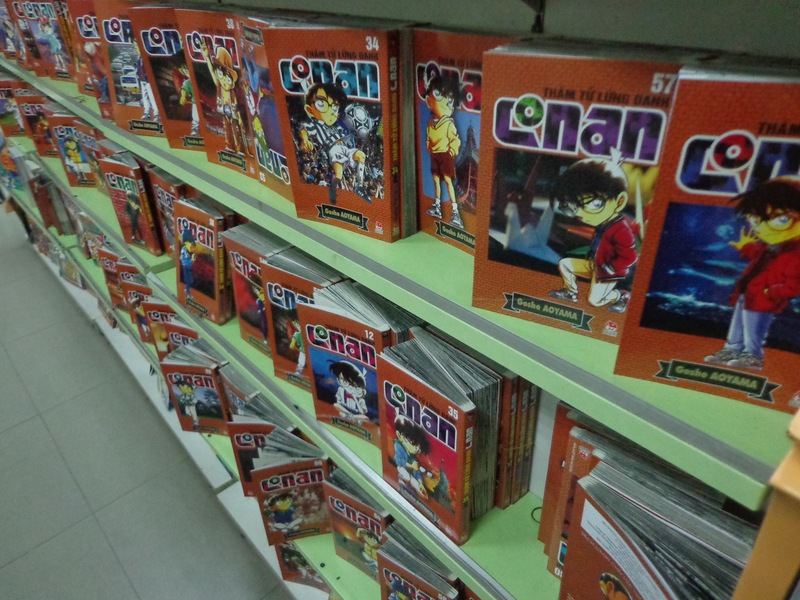 Detective Conan – Or what the English speakers would know as Case Closed. Doraemon – It’s as famous in Vietnam as in Japan and in India! 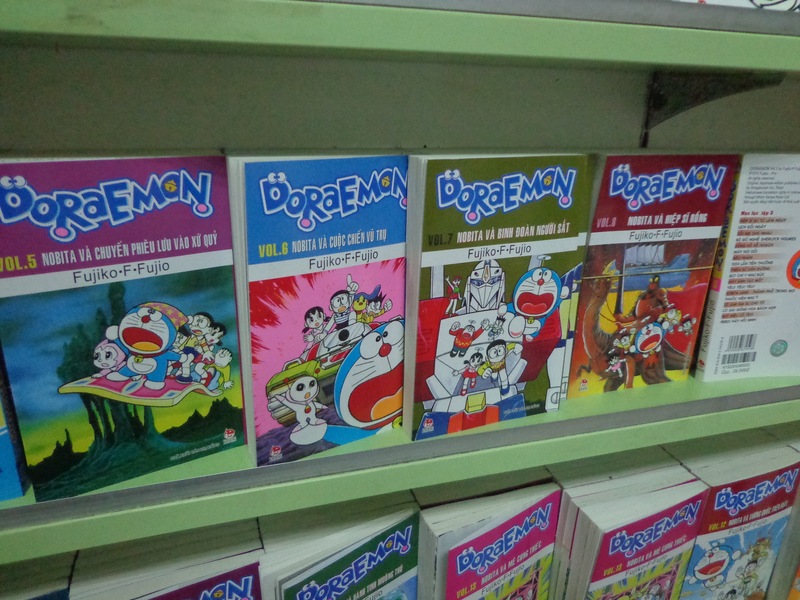 I am surprised that no Hindi publisher has taken pains to translate Doraemon mangas into Hindi. 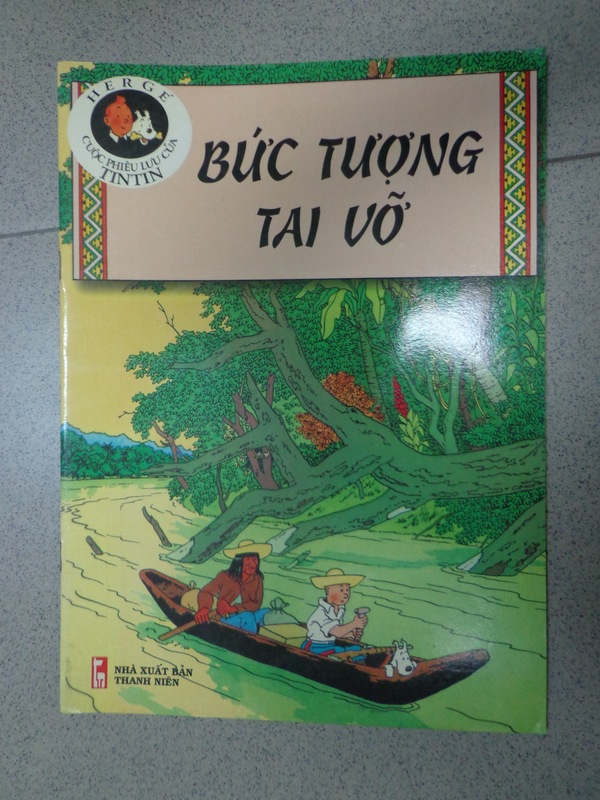 In the end I bought the Tintin album, the first volume of Dragon Ball and a native Vietnamese title, Học Viện Bóng Đá. I wouldn’t be able to make sense of the text, but hey, comics is universal!